Our church throws away a lot of the used clear plastic, bell shaped communion cups every Sunday. Does someone have any ideas how to recycle them throughout the year, craftwise? I'd like to make them with my kids' class (5-12 years old). The cups are 1 1/2 inches high. Please include Christmas theme ideas. Thank you. You could cut a cardboard wreath shape, have the children decorate the clear cups with markers or paint, and glue the decorated cups to the cardboard wreath shape. The cups could be used to make a checkers/chess/tic tac toe set by coloring/labeling the cups, and making a game board from cardboard. You could stack the cups 3 across, 2 across, 1 on top to make a Christmas tree shape, gluing them together. Decorate the cups first with paint or markers, and could be glued to a base to make a decoration. If you can make holes in the bottom of each cup (maybe using a heated ice pick or nail), the cups could be strung on ribbon or yarn to make a string of bells, putting a knot in each bell so it wouldn't slide down the cord. Could the cups be decorated with markers/paint, then glued to a base and used as tray favors or place cards at a nursing home or church function? Put a few candies in each favor. Let each child make a cup stacking game for him/her self. Google "cup stacking games" for game ideas. They could personalize their game cups by decorating them. Omanana; Thank you for the imaginative ideas! I hate to waste these cure cups! I had sort of the same idea of stringing them and knotting inbetween cups so they don't slip. Use glue and paper or tissue paper to do a sort of decopage design to make an inchworm or a snake that wiggles. Fill the last cup with beans to make a rattler. I was also thinking you could make them into garland for the tree. Remember making the paper chains? You could use them to place assorted glitter, beads, artist paint for dipping the paint brush in, etc. for easy access during crafting and they could still be reused again and again after those uses. Did you ever find anything crafty to do with these communion cups? I have a couple of ideas but didn't post them as not to waste your time or mine. Let me know, thanks. Take the cup and put in one small brown pom pom, clue a white one, to the brown one and a pink one to the white one. Top it with a tiny red pom pom. cut a stir stick in half and glue it just inside the cup, so that it looks like a stray. Put a small magnet on the back side of the cup and you have an Ice Cream Sundae Magnet. You can glue one small cup for the top of a candle holder, and one cup glued upsidedown for the bottom. Decorate with small silk flowers for small candle holders. I have been looking all over the internet for tiny bell-shaped cup like you are describing. My mom uses them to make tiny bird houses with plastic canvas, cut to 1.75 inch square. She fills the cup about a third full of bird seed, then glues one completed plastic canvas square on top, turns upside down, and glues another completed plastic canvas square, which become the base, so cup is upside down. 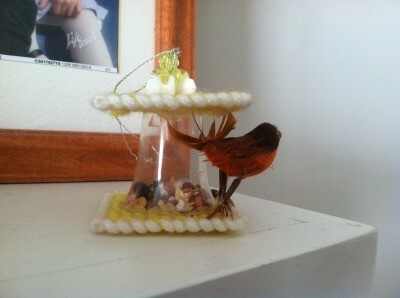 She attaches a string hanger to the top, and a miniature bird next to the cup, and it is really cute. The craft store no longer carry these cups, so I am trying to find a small quantify (20 to 50) of these cups for her. Check with a neighborhood church and ask them to save some for you. Wash them! Free craft supply for your mom. Check with local churches. Ask them to save some for you. Free craft supplies for Mom. I don't know if this message will be read?but here it goes,I took and made some adorable ornaments with these cups,and every one loved them,I made hanging Bella out of them but I made it so they could be used year round,also I've taken and put peanut butter around one then rolled it in bird seed,then I hung it up,and you should see the birds that come to these cups eveyday. To get the seed.the peanut butter keeps the seed in the cups it work perfect.Thanks Susie.